On Dec. 8, 2017, Jesus Badillo Garcia and his mother, Patty Garcia, curled up in a 10-seat van parked outside a nondescript brick building off Interstate 2 in La Feria, Texas, a small town eight miles north of the Texas-Mexico border. It was 4 a.m. and a frigid 34 degrees. Jesus, along with other children who are missing limbs, waited patiently for the doctors from Houston to arrive. Though it was still pitch-dark outside, a thin blanket of snow began to coat the flat, brown Valley. It was the first time it had snowed in the area in nearly a decade. Jesus and his mother had left their home in Mexico at 7 p.m. the evening before and headed to Monterrey, Nuevo León, where they caught a bus to the Pharr-Reynosa Bridge, some four hours away. After waiting three hours to get through immigration, they walked 15 minutes across the bridge to the U.S. side of the Rio Grande, carrying only their papers and something to drink. A white van, with “Shriners Hospital Children Transportation” emblazoned on the side, waited to take them and other families to the Rio Grande Valley Shriners Club of Al Amin in La Feria. Jesus Badillo Garcia and his mother, Patty Garcia, pose outside the Rio Grande Valley Shriners Club in La Feria, Texas. On any other day, the Shriners Club houses local meetings, bingo nights and small concerts for the community. But four times a year, the club transforms into a fully operational two-day outreach clinic that serves between 160 and 240 underserved and underprivileged children with limb deficiencies, club feet, hip dysplasia, cerebral palsy and other conditions that inhibit their motor abilities. More than 30 doctors, nurses, social workers, physical and occupational therapists, radiology technicians and orthotic-prosthetic professionals from Shriners Hospitals for Children – Houston travel to La Feria to provide care at no cost to the families. Orthotist Dave Zaborowski cuts a cast off a child’s leg at the clinic. Markings indicate what adjustments need to be made to a prosthetic leg. In 1922, Shriners International, an offshoot fraternity of Freemasonry, established a network of hospitals across the country dedicated to treating children with orthopedic injuries, diseases and birth defects. The first hospital, located in Shreveport, Louisiana, was initially named the Shriners Hospital for Crippled Children. Since then, Shriners has expanded its scope to treat burns, spinal cord injury and cleft lip and palate. But its mission remains beautifully simple: to treat any child up to age 18, regardless of race, religion or a family’s ability to pay. No child is ever turned away. Douglas Barnes, M.D., chief of staff at Shriners – Houston, assesses a child’s arm in the clinic. Each of the 22 Shriners Hospitals for Children across North America serves a designated area. Shriners – Houston treats patients from Texas and three northeastern states of Mexico: Tamaulipas, Coahuila and Nuevo León. Although patients south of the border are not American citizens, Shriners – Houston does not distinguish or discriminate when it comes to treatment. Whether they’re from the U.S. or Mexico, patients receive the same level of care. La Feria is the oldest of the four sites across the state where Shriners – Houston holds outreach clinics. The other clinics are held in Laredo, Amarillo and El Paso. Short of offering surgery, these clinics are equipped to take care of all the patients’ needs. The main hall of the 9,000-square-foot building in La Feria is sectioned into five different zones of organized chaos during the clinic: administration, where patient files and charts are managed; the clinic area, which is outfitted with examination tables; an imaging room for X-rays; a physical and occupational therapy zone; and an orthotic and prosthetic area for technicians to create casting molds for custom prosthetic limbs. A built-in workshop occupies an adjacent room, where technicians can make adjustments to orthotic and prosthetic devices right then and there. A Shrine clown entertains a child. Despite the snow outside, the La Feria clinic emanated warmth inside. Cartoon animal cutouts and stickers adorned makeshift dividers set up throughout the building. Children scooted around the hall in their walkers and wheelchairs, navigating rows of metal folding chairs. The Shriners volunteers, dressed as clowns or sporting their trademark red fezzes, traipsed around the hall with the children and their families, offering food, drinks and holiday toys. Many of the families had traveled six or eight hours to get to the clinic. Jesus, 17, was born with a curved tibia, a cleft foot and only three fingers on each hand. In 2004, when he was 4 years old, his mother took him to their local hospital to have his right leg amputated and replaced with a splint and shoe lift. Patty, who was born without a tibia, wears a prosthetic leg, as well. She knew that Jesus, like her, would eventually outgrow his splint and require a series of prosthetic legs as he got older. A prosthetic was necessary for his quality of life, but very expensive— a basic prosthetic typically costs between $5,000 and $7,000 in the U.S. Patty works for a car insurance company filing accident claims, but as a single mother, she worried about how she would pay for prosthetics for both herself and her son. Later in 2004, a stranger on a bus told Patty about the Shriners – Houston outreach clinic in La Feria. She decided to take Jesus and get him outfitted for a prosthetic leg. Of course, Jesus doesn’t remember any of this. Any memory of his amputation has evaporated from his mind. As far he is concerned, there was no physical disability to surmount, no tragedy over which to triumph. He never felt limited by his missing limb. Jesus Badillo Garcia sits in the waiting room of the Shriners outreach clinic in La Feria. Over the years, as Jesus continued to receive care at the Shriners – Houston outreach clinic, he met more and more children who were afflicted by congenital neuro- and musculo-skeletal disorders that curbed their mobility and movement. Some kids had legs of different lengths, some had arms with no hands, some had club feet. Devin Garcia tests out his newly-fitted prosthetic leg. He befriended other amputees, one of whom encouraged him to play soccer on a league created by a group of patients. An avid sports fan and natural athlete, Jesus joined the team and took up swimming and cycling shortly afterwards. He won competitions in both but fell in love with an altogether different physical activity: para dance sport, formerly known as wheelchair dance sport. Jesus is a member of the adaptive sports dance team at the Álvaro de Obregón Technical High School of the Universidad Autónoma de Nuevo León. He and other students with lower limb deficiencies perform in special wheelchairs and are often paired with standing partners. In previous years, Mexican patients and their families who visited the Shriners clinic in La Feria were able to cross into the U.S. with humanitarian visas. However, in 2015, the Mexican border patrol suddenly put a stop to this. Stephenson and Barnes couldn’t point to a specific reason why, but violent events in the area may have triggered tighter restrictions. That year, Reynosa erupted in violence when gunfights broke out and vehicles were set ablaze, leaving at least three dead. The mayhem, Mexican federal police said, was sparked by members of the Gulf Cartel who blocked the city roads and attacked federal forces. Over the past year, violence spiked in the city due to rival drug gangs fighting to control border smuggling routes and trafficking operations. Patty recalled trying to cross the bridge in the midst of the shootings. She and Jesus decided to travel by day to Reynosa and stayed in a hotel until they could leave the following morning. Violence along the border wasn’t the only thing patients and their families had to worry about. Now, in order to cross the border, patients and their family members must present both a Mexican passport and visa, which could cost approximately $400. As a result, some of Shriners’ neediest patients are unable to cross and receive the care they need. Despite these challenges, Shriners – Houston continues to work diligently to help patients and their families get the financial support and necessary documents they need to get to the clinic. Children and families are shuttled to and from La Feria in vans operated by Shriners volunteers. Jesus has traveled to New York and Canada to compete in para dance sport and is now one of the top medalists in Nuevo León. He hopes to one day compete in the World Cup of para dance sport, but for now is looking forward to going to college to study psychology. He has a bright future, Patty said, and it wouldn’t have been possible without Shriners. 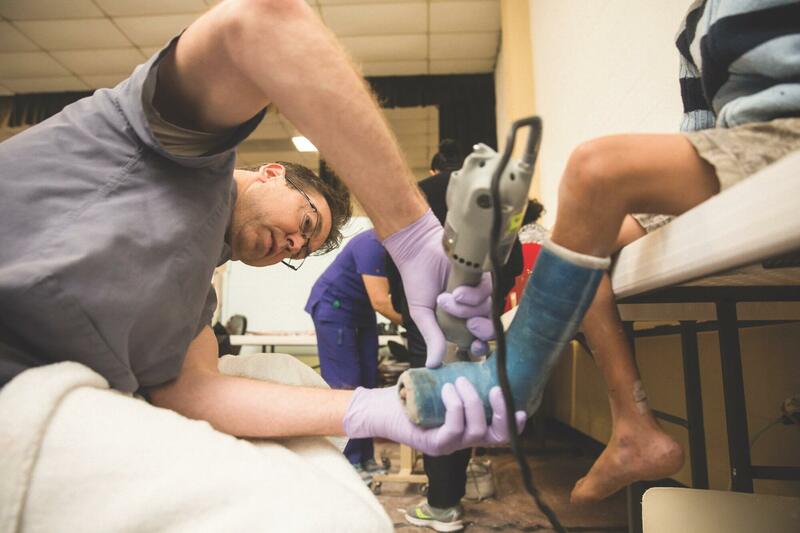 Orthotist Dave Zaborowski pulls vacuuming plastic over a foot and ankle orthotic to make a brace for a patient at the Shriners workshop in Houston. Note: The La Feria outreach clinics are supported by a grant from the Robert J. Kleberg, Jr. and Helen C. Kleberg Foundation.